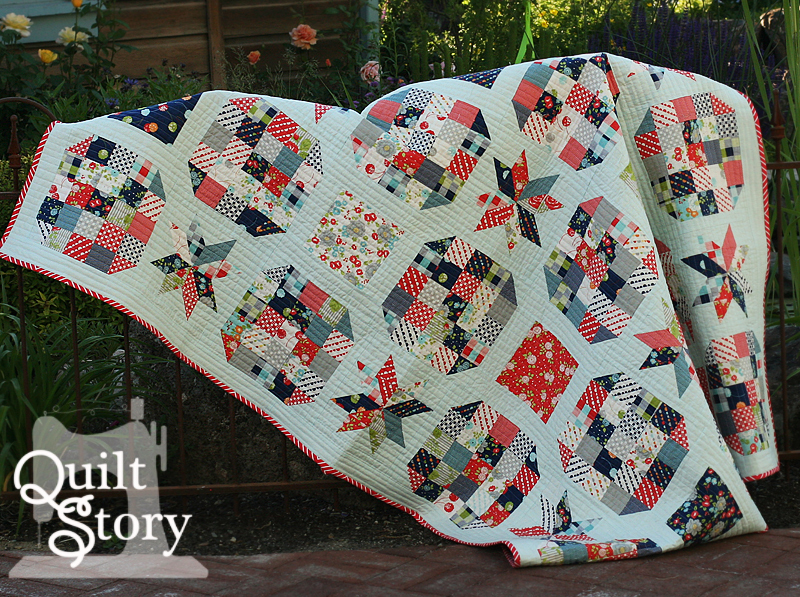 Quilt Story: Lucky Stars QAL! Join us!! Lucky Stars QAL! Join us!! The day has finally arrived! Okay, so maybe you haven't been waiting, but Megan and I have worked hard on these quilts and our Lucky Stars Quilt-A-Long, we really hope you will join us! We created our quilts from the beautiful Happy Go Lucky fabric line from Bonnie and Camille, for Moda fabrics. We thought it would be fun to use the same fabric line and pattern but show how different they can look in different colorways! What do you think?? Heathers Lucky Stars quilt finish. LOVE it! I worked hard the last week! We've both fallen madly in the love with this pattern (and with each other's quilts). There's already discussion of switching at some point. 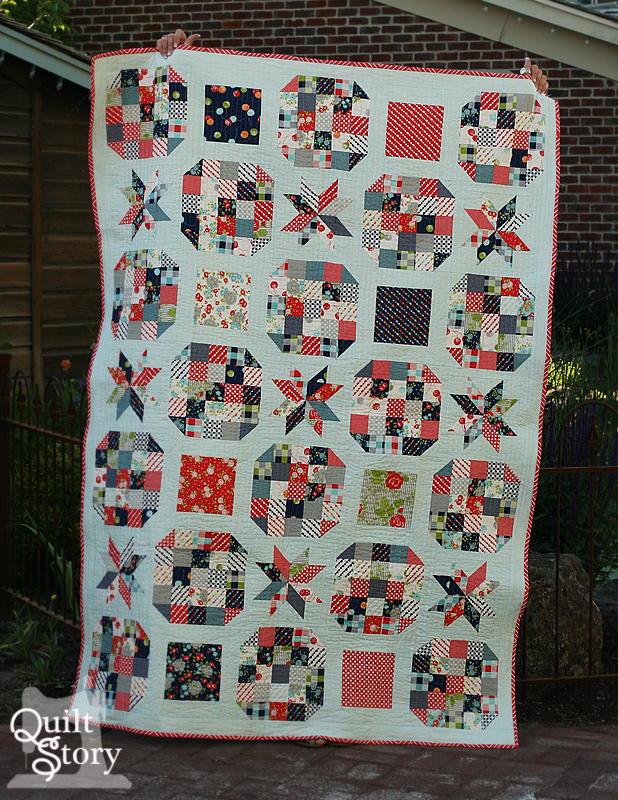 Megan's Lucky Stars quilt finish. Love the navy background. Makes it all "pop!" 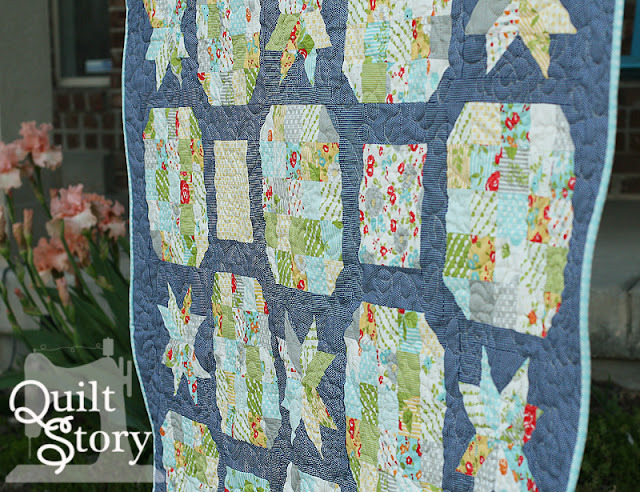 One of our sponsors, Christa Quilts has put together Lucky Stars Starter Kits for those of you wishing to quilt along. Each kit contains 1 Jelly Roll plus 1 Layer Cake of Happy Go Lucky by Bonnie and Camille. She's offering them at a special price of just $74.95 which includes free US shipping (discounted int'l shipping)! On top of that, use code STORY at checkout to save an extra 10% on your entire order so that you can purchase background fabric or other supplies. Those who finish their quilt tops by the end of the Quilt A Long will be entered in to win prizes from these amazing sponsors!! Hip hip hooray! Get a jump start and head over to Christa Quilts for a starter kit! Or start organizing your stash and thinking of what prints you'd like to use! Feel free to share these images on all the social networks! :) This is our first QAL and we want it to be a success because we both want to do it again. What do you think, are you in???? Beautiful quilts. Looks like fun. I hope I can join. I love this quilt! Well done, you two! Have fun with the quilt along. Your quilts are both beautiful and fun...yes i look forward to participating in this QAL.. I have to look at the fabric requirement...hope I have enough to join the fun. 💗Gorgeous, hope I have time spare to join in. Ooh I love them both! Let's see...can I add another thing to my never ending to do list...I really want to! I'm not ready to participate in a quilt-along yet, but I'm looking forward to following along and seeing all the wonderful blocks/quilts! Yes I'm in of course!!!! Great work and the quilts are stunning!!!!! Eeek! They are both beautiful! Love it! Looks like fun! I am in! I have a layer cake, just need a jelly roll and some extra fabric. This has really given me the quilt boost I needed. Haven't sewn for about 3 months. Thank you, Thank you. I love both of these quilts! Fabulous pattern. I really want to be in! I'd love to try (your quilts are BEAUTIFUL), but have a question. I've only made one quilt and it was super basic (just stripes). What skill level would you rate this quilt? Is it something that a beginner would have luck with or do you think it would be too challenging? Oh, also meant to ask how big is this quilt?? Beautiful quilts - need to see where I stand on committments because there are multiple qals that I really really want to attempt ... but with terminal cancer I need to set boundaries on what I tackle. Hi, I as wondering what the dimensions are and if it still counts if I make it even bigger? Sounds good! I think I'll be joining! Love the idea. I just don't have time to join a QAL right now. Hopefully next time. I want to be in! I'm hoping to keep up - because prizes are fun to win! I definitely want to participate in this QAL do I have to do anything to participate? As in sign up anywhere? Was it yesterday, or is it next wed when you give the fabric requirements? I'm in! Do we need to sign up somewhere? I'm confused; Do we get cutting instructions today or do we need to sign up somewhere else? Are the cutting instructions posted somewhere? Fabric Tuesday, and a teaser..